History books tell us of the difficulties of starting sugar cane plantations in Hawaii. Many dreamers set their hopes on easy riches only to find that growing and milling sugar cane in the islands was incredibly difficult. 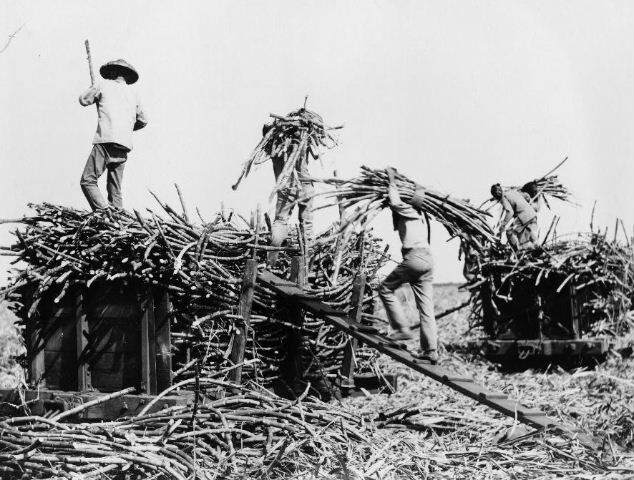 Not only was it difficult to find the right land, get laborers, and make a profit, getting sugar out of those stalks is not easy at all…especially with the technology of the 1860s. Just how difficult was it to process those sugar cane stalks to make the sweet and tasty sugar crystals we all enjoy? In a word–Extremely! Producing sugar was an exact science. One miscalculation and a batch could be ruined. The work conditions were tough from fields to mills. If the conditions out in the fields were harsh, inside the mills they were oppressive. It was hot and noisy, and some machinery was dangerous to work with. When mill accidents occurred they could be deadly. This is a look at sugar cane production once it is ready to harvest. It’s based on Mr. Rice’s plantation of Kauai as given in the book “Grove Farm Plantation”. This is how the process was done in 1860 and should give you an idea of what your ancestors were up against when they worked for a Hawaiian sugar plantation. When the sugar cane ripened, the cane stalks were about 12 feet tall. It was time for harvesting. Laborers swung machetes as they walked. The cane was cut close to the ground. Dust filled the air and laborers were battered by the sharp edges of the cut stalk. On top of that, it was hot. The temperatures made the work unbearable. When a row was done, the laborers returned to the beginning of that row. They put the cane into bundles which were loaded onto cane carts (later narrow gauge railway cars) and sent to the mill. Don’t think that it was only men out doing this work! Women were always part of the labor force, but at harvest time, all hands were needed. School was shut down and children helped bring in the cane. The cane carts were taken to the mill. The mill was run by water power (steam) and outside the mill was a dam for this purpose. Before the cane entered the mill, it was removed from the cane carts. Rollers run by water were set into motion. A laborer fed the sugar cane stalks one by one onto these rollers. 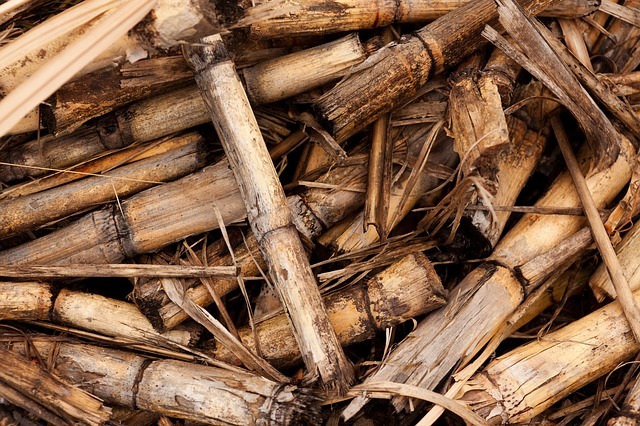 A dirty mixture of cane juice, dirt, and cane stalk was produced. This flowed into a basin and then ran out a spout. The dirty mixture produced outside the mill was clarified to remove the impurities. Huge vats set over ovens were used for this process. Milk of Lime (powdered lime and water) was mixed with the sugar mixture. The amount of lime was important. Too much lime and the grains came out too dark. Too little and the grains wouldn’t form. Every batch of sugar was different making this part all the more difficult. The Milk of Lime was stirred in gently. The entire mixture was brought to a near boil. This was allowed to settle and then the scum was removed. The mixture was boiled again for ten minutes and allowed to settle once more. About 30 minutes later, clear juice was drawn from the top of the vats. Once the sugar mixture was clarified, the mixture was sent to the boiling house. This included five shallow pots approximately 6 feet in diameter and each smaller than the previous pot. They were bolted together in a row. Wood and cane trash were used for the fires under the pots. The purpose of using 5 consecutively smaller pots was because so much steam was produced in the process it made it difficult for workers to remove the scum that rose to the top. Pouring the boiling mixture into a smaller pot allowed for the juice level to remain at the top of the pot. 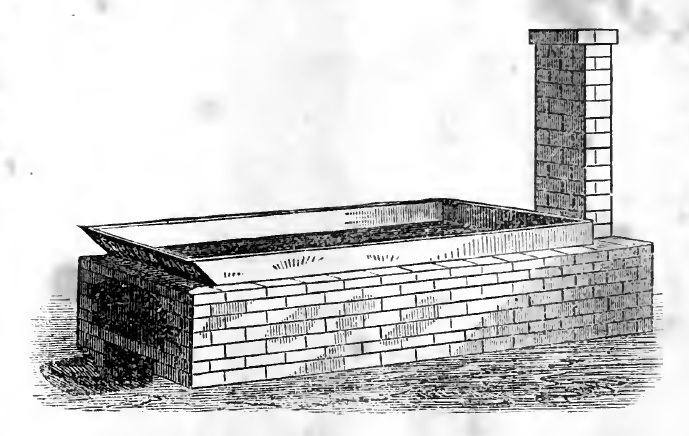 One style of sugar cane evaporator with boiling pan offered in the 1860s. It came in various sizes. The liquid in the pots was boiled. At this point, it is a syrupy mixture. “Sweeps” shaped like oars were used to skim off the froth. Each mixture was worked into a pot until it worked its way down to the last pot. The “Sugar Boiler” has an important job. This person dips a poll into the last pot. He then pours the syrup into a water filled jar. The point of this is to determine when the last pot has reached the maximum number of crystals. If the Sugar Boiler is happy, a “strike” is performed and the mixture in the last pot is moved to the cooling vats. Once the last pot is emptied, then all the mixtures are moved down a pot. The first pot is refilled with fresh sugar cane juice. The process is then started all over. Once the sugar cane juice has cooled, it’s really two substances: molasses and sugar. The sugar was the important part. In the 1860s, the molasses was seen as undesirable. 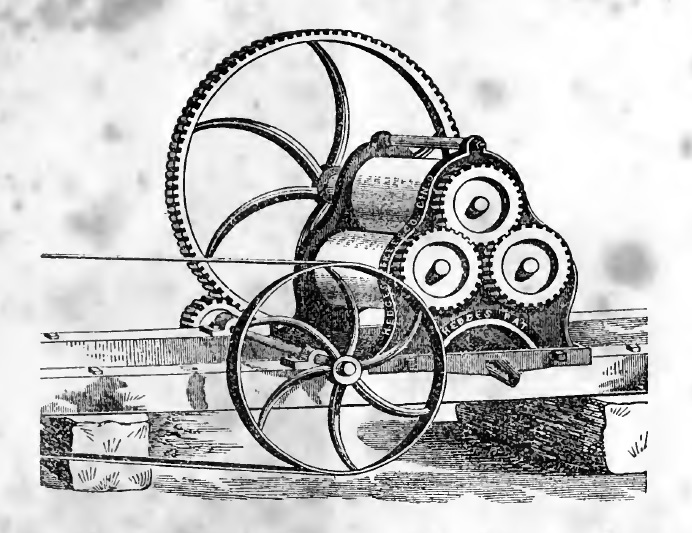 Once a machine called the “Centrifugal” was invented, the task of separating sugar from molasses became much easier. How did the Centrifugal work? A wood furnace was fed to keep it’s steam engine working. The sugary mass was spaded from the cooling vat to a brass cage. There was a tub inside the brass cage which held the mass. The cage was set into motion. It revolved around slowly at first, then went faster and faster. As the sugary mixture spread throughout the tub, the molasses began to seep out of the screens of the cage. In this way the molasses and sugar crystals were separated. Because the molasses might still hold crystals, it would be sent back for more boiling until all the recoverable crystals were produced. That’s How Sugar Cane Was Produced in the 1860s! So, there you have it! The sugar that you sprinkle on your cereal and in your coffee has to go through quite a process before it gets that way. In the days of steam power, this was an arduous task. Those who worked in the fields were subjected to harsh physical rigor. It was backbreaking work at every point as the sugar cane grew and was harvested. Those who worked in the mills worked in terrible conditions. Just think! There was no air conditioning as they worked around those boiling vats. The precision needed to produce sugar from cane almost makes you wonder why they tried, eh? Of course, we know why. It was all about making money. As progress and mechanization came to the sugar cane industry, it would be easier to produce that delicious sweetness from the sugar can stalks. 1. Krauss, Bob. Grove Farm Plantation: The Biography of a Hawaiian Sugar Plantation. Pacific Book Pub., c1983. 2. Takaki, Ronald. Pau Hana: Plantation Life and Labor in Hawaii, 1835-1920. Hawaii : University of Hawaii Press, c1984. 3. Kuykendall, Ralph. Hawaii: A History from Polynesian Kingdom to American Statehood. Prentice Hall, c1979. Images of sugar cane processing equipment are from the “Annual Illustrated Catalogue Sugar Making Apparatus, Farm Equipment, &c, &c: Manufactured by James L. Haven& Co.” c1867 : Cincinatti, OH. Thank you Internet Archive for providing this book for free!